Crompton Greaves Ltd, a name synonymous with rotating machines have DC Motors Technology inherited from SIEMENS, Germany, the pioneer and world leader in DC Motors. 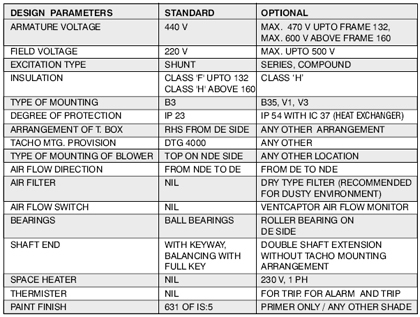 Today, Crompton Greaves offers an entire range of world class DC Motors. The motors are manufactured at Crompton Greaves Ltd. Ahmednagar factory, an ISO accredited set up having state - of - the - art manufacturing facilities. The high quality standards maintained in manufacturing and testing give superior electrical and mechanical features - making the motors most suitable for operating in tropical environments. Practically sparkless commutation with converter feeding, even under overload conditions is achieved. As a result, the brushes have an extremely long life. 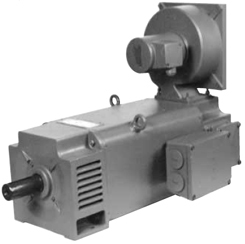 The blowers of DC Motors have three phase motors with wide range of winding and supply voltages. 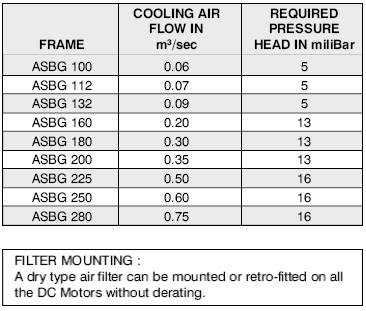 The blower motors are selected strictly in accordance with the air quantity required and ensures cool running of motors under the specified operating loads / overloads. The terminal box of blower motors are easily assessible. 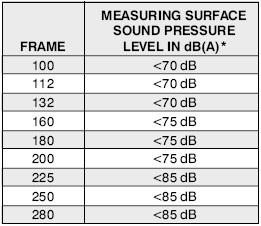 The noise levels of the motors have been calculated in accordance with DIN EN 21 680 and are well below the values permitted by EN 60034 - 9. They have been achieved both by means of design measures and by optimising the magnetic circuit and the separately driven fans. 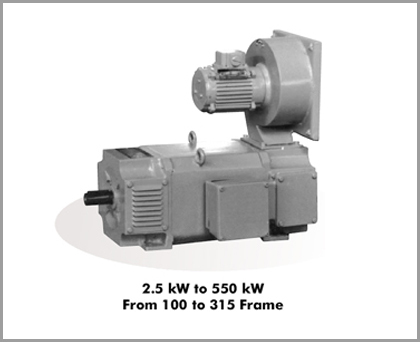 Crompton Greaves Ltd., a name synonymous with rotating machines backed by its long proven expertise in the field of DC motors offers the entire range of state of art Auxiliary Mill Duty 800 series DC motors in frames 802 to 818 from 7.5 kW at 900 RPM to 187 kW at 435 RPM to AISE/IPSS Standards. 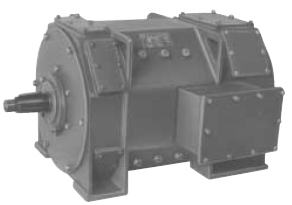 These motors are very rugged, reliable and suitable for steel mills or like applications. 818, 816, 814, 812, 810, 808, 806, 804, 803 & 802 frames are manufactured at CGL, LT Motors Division, Ahmednagar (Lam yoke DC motor frames 100 to 280 are also manufactured here). M3 Division is accredited with by BVQI for ISO 9001 Certification Quality Management System. ⇒ Conforming to AISE technical report no. 1-1991 / IPSS 1-03- 002-94. Full speed, half speed and quarter speed designs available. ⇒ Suitable for operations upto 500 volts. ⇒ Suitable for operation on 3 phase, 6 pulse thyristor converter. ⇒ Class 'H' insulation with class 'F' temperature rise limits. ⇒ Armature class 'H' with VPI in solventless polyesterimide resin. ⇒ TIG welding of armature coil connection to commutator. ⇒ Split / Non split yoke without compensating winding or non split laminated yoke with compensating winding. 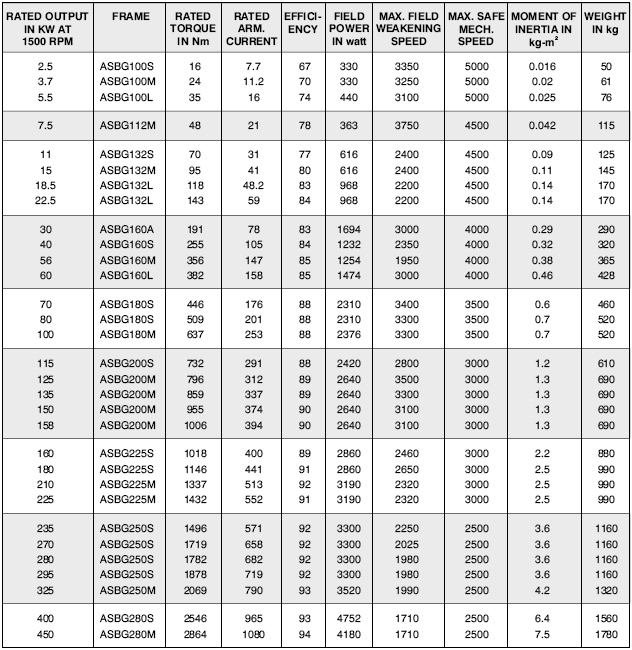 However split yoke is preferred for 808 & above frames and compensating type for 812 & above frames. ⇒ Double shaft extension 1:9.6 taper with key way paralle to taper as per AISE or 1:10 taper with key way parallel to shaft axis as per IPSS. ⇒ Convertible between TENV & TEFV enclosure or with top mounted blower unit. ⇒ Loose hanging leads or terminal box as required. ⇒ Axial play of 3 mm approximately of shaft. ⇒ Brush position of 45 deg. for easy access for maintenance (except in case of laminated yoke version). Motor mounting dimension can be matched to replace 600 series motors to AISE or Russian standard.